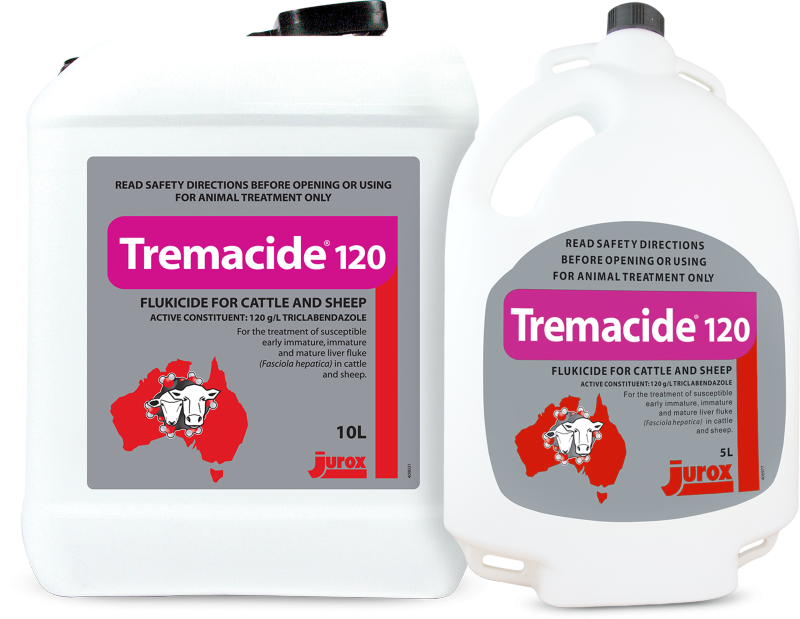 Tremacide® 120 contains triclabendazole, a member of the benzimidazole family of drenches. It is a ready-to-use, free flowing aqueous suspension for the treatment and control of acute and chronic fasciolosis of cattle and sheep. Tremacide® 120 is palatable and may be administered to young, pregnant, weak or debilitated animals. Treatment and control of acute and chronic fasciolosis in cattle and sheep caused by susceptible early immature, immature and mature liver fluke (Fasciola hepatica). Meat: DO NOT USE less than 21 days before slaughter for human consumption. Milk: DO NOT USE in lactating cows or ewes where milk or milk products may be used for human consumption. DO NOT USE less than 21 days before calving or lambing in cows or ewes where milk or milk products may be used for human consumption. Where cow or ewes are accidentally treated within this period or should any cows or ewes calve or lamb earlier than 21 days after treatment, milk will contain residues. This milk must not be used for human consumption or supplied for processing for at least 21 days following treatment. Calves fed this milk should not be slaughtered for human consumption within 10 days. Lambs fed this milk should not be slaughtered for human consumption within 7 days.